If you read my last post you will see that I made Cuban bread for a Cuban sandwich that we have wanted to make for ages. When it comes to sandwiches I have been a fan ever since I was a kid. I was lucky to grow up on a farm, where we never went hungry. Meat was always abundant and we rarely had meatless meals, except when Lent rolled around. But when I was a kid and my mom would be making steaks for dinner, I would beg to have a tuna fish sandwich; I wasn’t too big on meat back then. 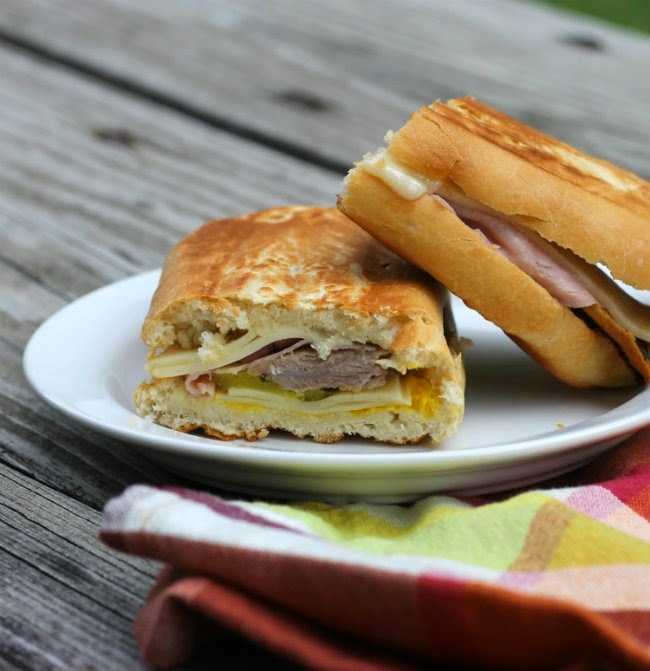 To this day I still love a good sandwich, which brings me to this Cuban sandwich. 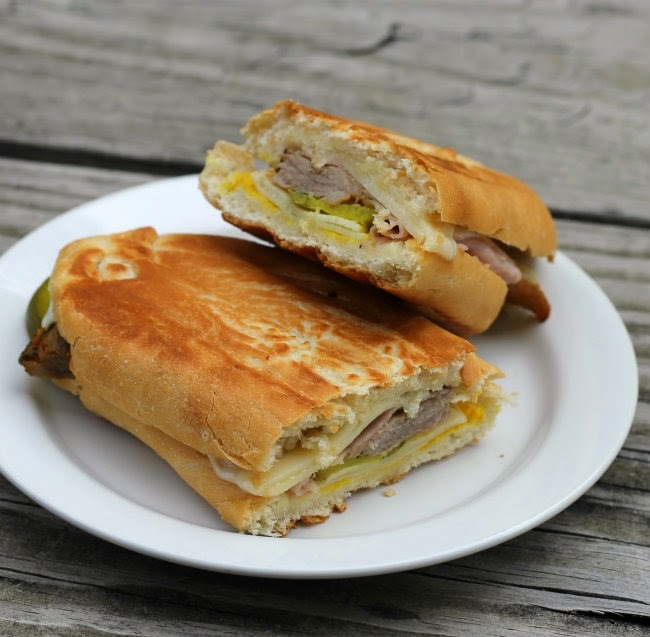 The sandwich is layered with pickles, ham, marinated roasted pork, and Swiss cheese… a wonderful combination. You don’t have to marinade the pork, but I would seriously suggest that you do so. It brings a wonder flavor to the sandwich. This is a sandwich that we will be making quite often. 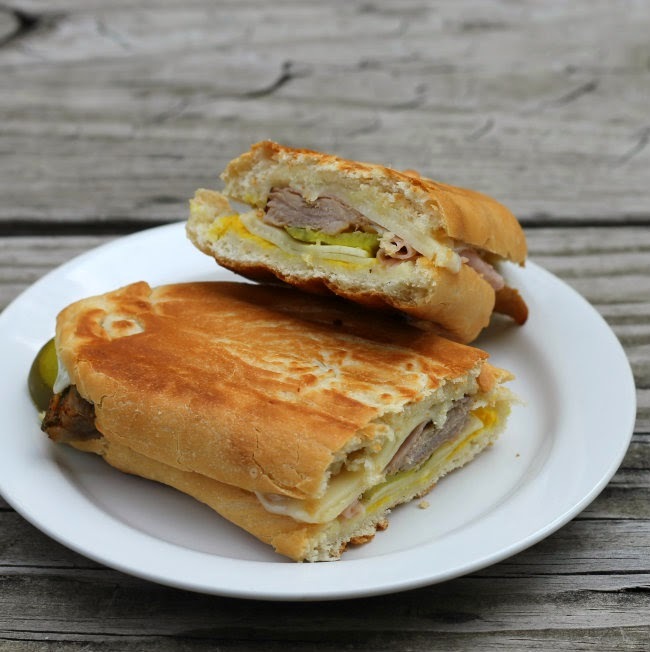 I am hoping to go to Miami some day and try an authentic Cuban sandwich, but until then I will be enjoying this one. 1. Add all the ingredients to a zip-lock bag, except for the pork. Make sure that the ingredients are mixed well. 2. Add the pork and coat the pork with the marinade. Set in the refrigerator for 4 to 24 hours. 3. When the pork is ready to roast place it in a roasting pan and roast in a preheat oven at 425 degrees F for 45 to 60 minutes or until no longer pink in the middle. 4. Remove from oven and cool before slicing thinly. 1. Slice the Cuban loaves half horizontally. 2. Brush the top of the cut side with olive oil and the brush the bottom of the cut side with yellow mustard. 3. Layer the sandwich with Swiss cheese, sliced pickle, ham, sliced roast pork, and then with additional Swiss cheese. 4. To grill the sandwiches use a Panini maker or an indoor grill, such as a George Foreman Grill. 5. You will want to grill these sandwiches, top and bottom, while at the same time flattening them slightly. This will help melt all of the filling ingredients. If you don’t have a Panini maker or an George Foreman Grill you can use griddles or skillets. Brush the bottoms of the sandwiches with olive oil. Place them in the greased pan. Brush the tops with olive oil then top them with foil, then press down with another skillet or flat sheet pan (non-melt-able) object. The point is to provide a flat surface for a weight. Place something that is heavy on the top pan to press down the sandwich. 6. Grill the sandwiches for about 5 to 7 minutes over medium heat, checking often to make sure that the bottoms aren’t burning. If you are making the sandwiches in a skillet you will want to flip them to brown the tops of the sandwiches. The outside of the bread should be slightly crisp and the cheese melted. This makes my mouth water. I love everything about that sandwich! You definitely put those homemade buns to good use! I’ve heard so much about Cuban Sandwiches but I’ve never had one. Now I can make my own. These look incredibly delicious! I never had one before – I know my Dad would love them! I bet those homemade buns made all the difference. Thanks for taking the time to leave comments on my guest post the other day!